The Farmers' Market of Keene offers a wide variety of fresh and locally produced goods right in the heart of Keene. Every Saturday, 9a.m. to 1p.m. Every Tuesday, 4p.m. to 7p.m. We're hiring a market manager! Visit our "Employment" page to read the job description. Forgot to visit the ATM? No problem! The market now accepts credit, debit, and EBT cards. We'll swipe your card for the amount you request and provide tokens that you can redeem with the vendors. For customers using SNAP benefits (food stamps) we have extra good news for you! Thanks to the support of Wholesome Wave, Cheshire County Conservation District, and the New Hampshire Food Bank we are now able to match your first $10 food stamp purchase. 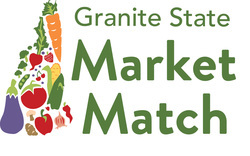 **Special-market match dollars are Now unlimited!